One of the reasons I bought an iPhone in the first place was so I could use Google Maps to navigate San Francisco’s public transit systems. I just started working in the City a couple of years ago and I went and bought an iPhone so I could punch in the address of where I wanted to be and the phone would tell me “go two blocks down and get on the #10 bus (which will be at the bus stop in 3 minutes).” I could even watch the phone’s GPS marker show me where I was so I knew when to get off the bus or MUNI or BART or whatever. I’ve since taken my phone to other cities and I don’t even bother to rent a car if the city has a decent transit system. I can navigate the ‘L’ in Chicago or Portland’s MAX transit using Google Maps. So I was not happy to hear that Apple was replacing Google Maps on iOS 6 / iPhone5 with their own mapping program that doesn’t support public transit systems the way that Google Maps does. Not only that, they won’t let you download the Google Maps app from the iTunes store because they don’t want it to compete with the Apple Map app. 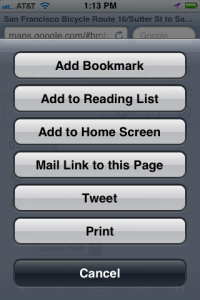 Start up Safari on your iPhone. Type “maps.google.com” into the location bar. Click “yes” if it asks if it can use your location. Click the bookmark button at the bottom/middle of the screen. 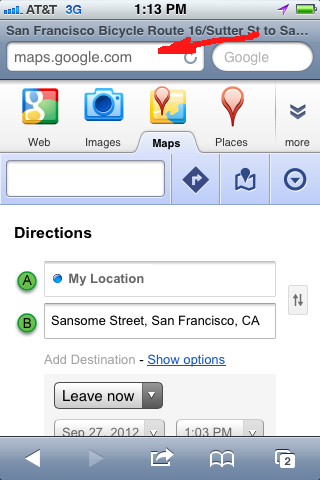 You should now have a new “Google Maps” app on your iPhone screen that links you directly to maps.google.com. It doesn’t look exactly like the old app, but all of the functions are there, including the ability to plan a route using public transit. This entry was posted in Apple and tagged Google Maps, iOS6, iPhone5. Bookmark the permalink. not true – it’s because one does not exist…. I’ve had an iPhone for over 2 and a half years. I used the Google Maps app all of the time. It wasn’t a figment of my imagination, it exists, but it gets over-written once you upgrade to iOS6, and you can’t re-install it from the iTunes store. Since all iPhone5 phones have iOS6 pre-installed, you’re out-of-luck if you want to install a Google Maps app from iTunes. The app could be made available on iTunes, Apple won’t make it available because they don’t want it to complete with their new 3D TomTom-licenced technology map app. It was an Apple app using Google Maps tech licensed from Google, not an app published by Google, but it does and did exist and you can no longer get it for your iPhone once you upgrade to iOS6 or if you buy an iPhone5. For those of us who rely on Google Maps for public transit information this is a major pain. Adding a web shortcut to your home screen isn’t as elegant as the original app, but it makes public transit information easily accessible and will work for me as a stop-gap measure until something better comes along. 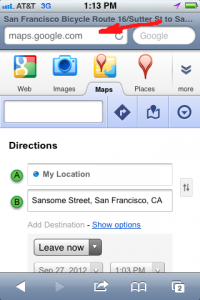 http://www.theverge.com/2012/9/25/3407614/apple-over-a-year-left-on-google-maps-contract-google-maps-ios-app). Until then, I’ll use my shortcut. This morning Apple CEO Tim Cook printed an apology to iPhone users for the new iOS6 Map application: http://www.apple.com/letter-from-tim-cook-on-maps/. In the apology he published a link to a page encouraging people to create a website icon on their iPhones “For fast, easy access to Google and Nokia maps on the web.” The link goes to an Apple page listing the same steps that are in my blog post. Now that the new Google Map app is available how do I get rid of this icon? Put your finger on it. Wait. Press the [x] to delete. Can’t delete as you’ve instructed. BlueSky: I was referring to the icon you’d create for Google maps if you followed the instructions in this (now out-of-date) article, not the map app installed by Apple. If you don’t want the Apple map, or any of the other built-in apps, on your front page, move them to another page, such as the last one. You can even create a new last page and stick them there. No reason to let them take up prime real estate.